NRS Maverick Solo Inflatable Whitewater Kayak. Designed for Class IV & Class V Rapids. See more info at NRS. Of all the inflatable kayaks available, perhaps no other kayak is as well built as the inflatable whitewater kayak. These kayaks, designed to survive devastating impacts into rocks and trees, for falls over ledges, and to be pounded by massive waves—are without question the most durable inflatable kayak available. These kayaks are also the most specialized inflatable whitewater kayaks available. These kayaks have been specifically designed to do one thing above all else—and that is to run the nastiest, most powerful whitewater rapids you can find. Unfortunately, the specialized nature of these types of kayaks limit their utility to many paddlers. So does this specialty kayak’s capabilities meet your own paddling requirements? Do You Need an Inflatable Whitewater Kayak? Whitewater inflatable kayaks are designed for, as their name suggests, whitewater. But that brings up a question—what, precisely, is a whitewater rapid? Whitewater is formed in a rapid, when a river’s gradient increases enough to create so much turbulence that air is entrained into the water body, that is, it forms a bubbly or aerated and unstable current; the frothy water appears white. The term is also loosely used to refer to less turbulent, but still agitated, flows. The term “whitewater” also has a broader meaning, applying to any river or creek itself that has a significant number of rapids. The term is also used as an adjective describing boating on such rivers, such as whitewater canoeing or whitewater kayaking. Now, by this definition, virtually every river has some whitewater in it. Almost all rivers have enough turbulence, somewhere, that forms “bubbly or aerated and unstable current” that causes the water to appear white. Typically, this “whitewater” consists of small ripples or is created by waves caused by larger rocks in the river or perhaps a tree partially across the river. In short, “whitewater” by this definition is rather all encompassing. Helpfully, there is a scale that rates whitewater rapids. This scale goes from Class I (easiest) to Class VI (most difficult). Basically flatwater. Few obstructions. Some small riffles. An occasional wave that is easily avoided. Anything that “floats” can make it down a Class I river section. Class II rapids have more riffles, more obstructions and often contain frequent or larger waves that are either easy to avoid or simply run through. Some knowledge of paddling is required in order to avoid running into the obstructions—particularly downed trees or exposed rocks. Virtually all inflatable kayaks can make it through Class II. However, some boats paddled by inexperienced paddlers—canoes in particular—often capsize in Class II rapids due to the paddler’s inability to keep the canoe pointed straight down the river. A canoe that’s going sideways through weak rapids or which hits a small wave on its side is easily capsized. Narrow passages. Much larger waves (4ft+). More frequent periods of whitewater that also run for longer stretches of water. Paddler must have good paddling knowledge to avoid obstructions, weave through waves and rocks, and most critically can keep their kayak facing down the river. Some recreational level inflatable kayaks can run Class III rapids without too many issues, provided the paddler knows what they’re doing and the boats have drain valves that allow the kayak to drain any water that happens to come into the boat (which it will in Class III and stronger rapids). Cheaper inflatable kayaks, however, are often punctured as they bang into rocks or are contorted into positions that stress the boats fabric. These cheaper inflatable kayaks almost always lack drain vales too, which prevents the boat from draining out water. Finally, dedicated lake-padding inflatable kayaks (such as the Sea Eagle FastTrack) aren’t suited for Class III whitewater—their skegs, inflatable keels and low sidewalls all combine to make these boats very difficult to maneuver and keep upright through fast moving, turbulent water. The ability to run Class IV rapids is what separates whitewater inflatable kayaks from even the best quality recreational inflatable kayaks. Waves are large, irregular and rapids run for considerable periods. Drops up to five feet may be encountered. Current is very strong due to the steep slope of the river and the water has significant turbulence. Large amounts of water almost always pour into the boat regardless of paddler skill—thus requiring that the kayak have the ability to drain the water away quickly. 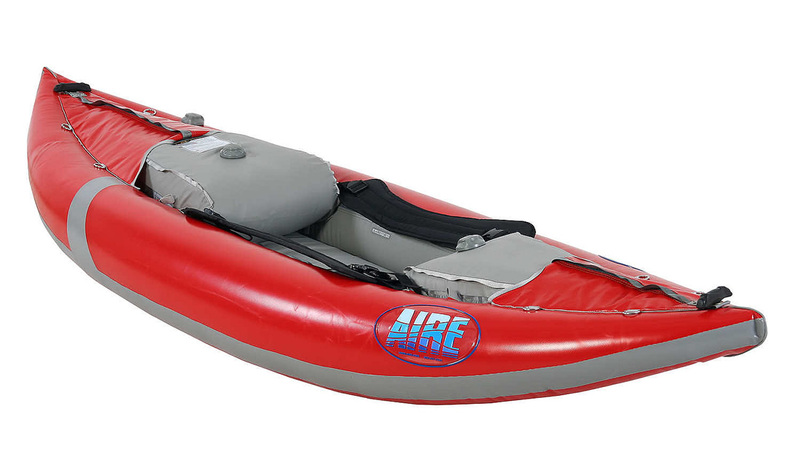 Aire Force Solo Inflatable Whitewater Kayak. A solo inflatable kayak designed for intense whitewater. Highly maneuverable due to its short length. See more inflatable whitewater kayaks at NRS. To run Class IV whitewater, you need a kayak that can endure the pounding it receives while running these rapids. The kayak must be self-bailing, have a tough fabric to avoid punctures when it’s thrown into rocks or skirts over submerged obstructions and can endure the pounding Class IV whitewater inflicts on inflatable boats. Recreational and lake-paddling inflatable kayaks are wholly unsuited for this type of whitewater, even if they have drain valves. Only good-quality expedition level inflatable kayaks (such as the Sea Eagle Explorer Series) or dedicated inflatable whitewater kayaks are built-well enough to tackle Class IV rapids. Scouting of the rapids if often, but not always, required. Highly dangerous rapids. In the event of problems, there’s a real possibility of death or severe injury to the paddler. Rapids are long, complex and crazy fast. Large drops over five feet are also often encountered. Scouting is almost a per-requisite to successfully run Class V rapids, since even slight changes in water levels greatly affect how a Class V rapid behaves. Photographer/paddler in this video is using an Aire inflatable whitewater kayak. Note how short the kayak is in length, how it nearly “surfs” across the water, and how remarkably fast the boat drains of water. Video primarily shows Class V rapids, but there’s some Class IV’s in there as well. The only inflatable kayak that can safely run this type of rapids is a dedicated inflatable whitewater kayak. Their shorter length allows for quick and precise turns. Their fabric is made from the strongest available (usually 2000 denier) so as to not puncture when slammed into a sharp rock at 12+mph. And finally, these kayaks have superb self-bailing capabilities. As water flows into the kayak, it quickly flows out through the drainage holes—allowing the kayak to stay maneuverable and avoid being swamped by big waves. Borderline impassable. Requires highly specialized gear and training to run this type of rapid. Unless you really know what you’re doing and have the gear to do it, bring along your tombstone to make life simpler for everybody else later if you decide to run this class of rapids. Lastly, there are sub-categories of each rapid classification. Thus, a “weak Class II” is much different than a “strong Class II” rapids. A weak Class II might just have some occasional larger waves that are easily avoided, while a strong Class II might possess a fast current with a “wall of waves” clear across the river that can’t be avoided. To further complicate things, water levels play a critical role in how strong or weak a rapid is. Usually, but not always, the higher the water level is the more powerful the rapids are. Thus, a “weak Class II” rapid in lower water conditions might jump to a “strong Class II” or even a “weak Class III” rapid during higher water conditions. So Who Needs an Inflatable Whitewater Kayak? If you read through the whitewater rapid classification system (above), you know that a dedicated inflatable whitewater kayak is only strictly needed if you plan to run Class V rapids—since they are the only type of inflatable kayak designed to survive (and keep a paddler alive) through such powerful rapids. For Class IV rapids, dedicated inflatable whitewater kayaks are sure nice to have, but tough expedition level inflatable kayaks are also fully capable of running these types of rapids. These kayaks may not run Class IV rapids as well as a shorter whitewater kayak, but expedition level inflatable kayaks will get paddlers through most Class IV rapids provided the paddler is experienced, the drain valves are open and boat isn’t weighed down by hundreds of pounds of gear. NRS Maverick Two Person Inflatable Whitewater Kayak. The sleek design and high rocker panel (front of the kayak) clearly show this is designed for intense whitewater. See more inflatable whitewater kayaks at NRS. Thus, inflatable whitewater kayaks are highly specialized kayaks. These kayaks are meant for people who run Class IV and Class V rapids frequently. Can inflatable whitewater kayaks work for other types of rapids (Class I – Class III). Of course. Indeed, for day trips down even lazy rivers these kayaks are lots of fun. Moreover, inflatable whitewater kayaks suffer from one major problem. By design, these kayaks are short and thus have limited weight capacity. As such, these kayaks aren’t meant for long, overnight trips. They simply lack the space and weight capacity to bring much gear along. While they’ll work ok for a night, maybe two, forget about using them on long float trips. Finally, inflatable whitewater kayaks lack the flexibility that expedition level inflatable kayaks possess. You won’t be able to attach a skeg to it—to make flatwater paddling quicker and easier. Gear tie-down points are limited—and often times, non-existent. And the seats, which are designed for day trips through heavy rapids and work extremely well for that purpose, are uncomfortable for use on multi-night excursions. In short, whitewater inflatable kayaks are meant for—you guessed it—whitewater. If you plan to frequently take day trips that involve running Class IV rapids—with the occasional trip through Class V, then this type of kayak is meant for you. However, if you want to take long overnight trips but still need a tough boat that can tackle all but the more extreme whitewater, then an expedition level inflatable kayak is likely a better choice. Expedition level inflatable kayaks simply have more versatility due to their length, weight capacity, detachable skeg and the numerous options that can be added to the boat (sail, rowing frame, fishing seats, etc…). Overall, the inflatable whitewater kayak is a true specialist. It specializes in one thing—running strong whitewater rated Class IV or Class V. If your kayak needs fall into specialty, then such a kayak is ideal for you. Otherwise, I’d suggest finding a different type of inflatable kayak that is more suited to your paddling needs. 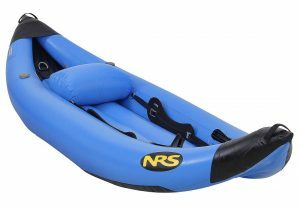 In the world of inflatable kayaks designed for strong whitewater, anyone shopping for such a boat should start—and finish—their shopping at NRS. It’s the only place online that has a large selection of single/tandem bulletproof, high-quality inflatable whitewater kayaks. Indeed, their kayaks are so popular—and so rugged—that most whitewater guide services use NRS kayaks. 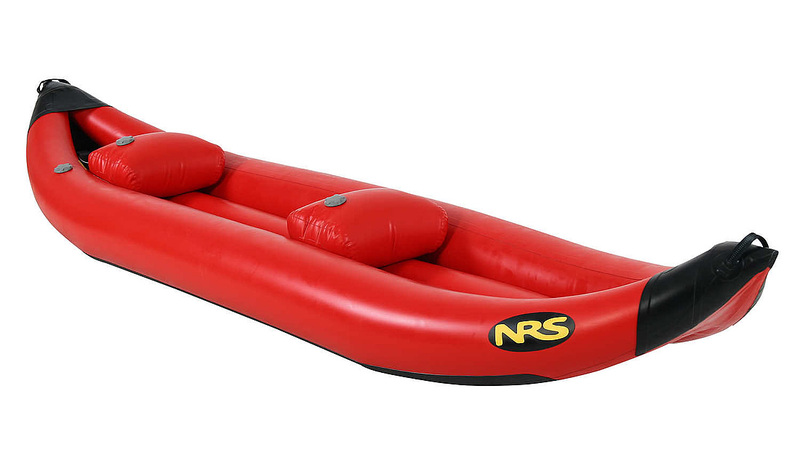 NRS also sells the equally rugged, and just as popular, inflatable whitewater kayaks from Aire. Whether you go with an Aire or NRS kayak depends on what features you’re looking for. In terms of durability, maneuverability and design—kayaks from both companies are superb. So just compare the kayaks features to go with the one that most closely meets your paddling needs. Aire and NRS inflatable whitewater kayaks (as well as rafts/catarafts) at play in Class IV, V and some VI whitewater. If only I had the money and storage room for this beast of an inflatable boat.